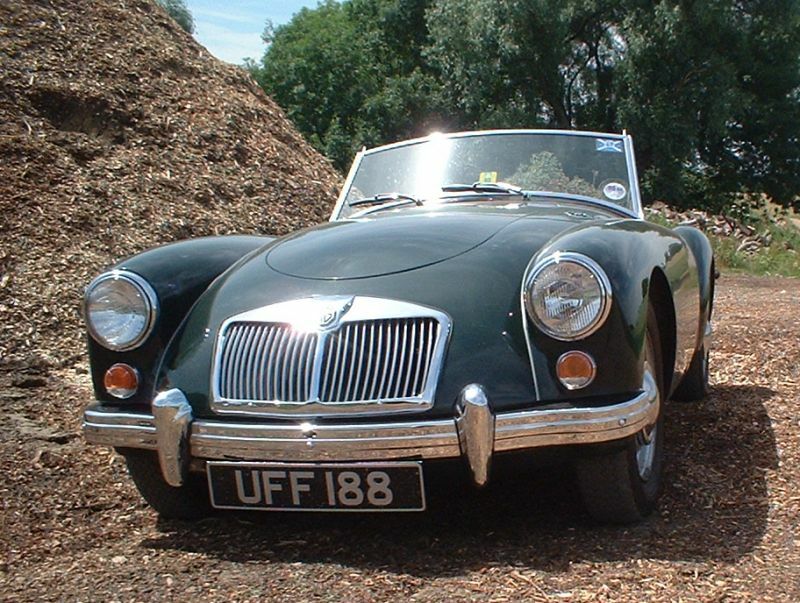 I bought the MGA after my first year studying engineering at university. I was fed up with all the maths and wanted to do something practical. 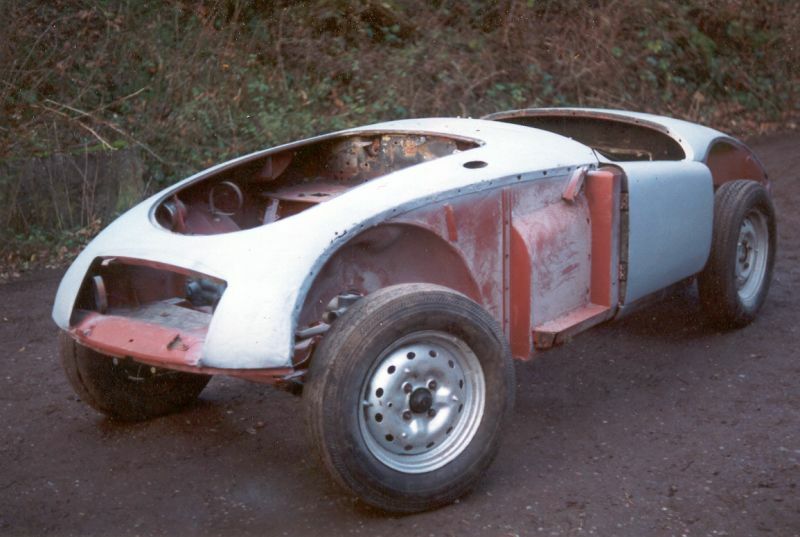 It was an expensive project for a student, and money was spent on the body and chassis. The engine was replaced a few years later. This was my first view of the car from 1992 sitting in a large barn in Inverkeilor, Scotland together with a variety of Triumphs and Jaguars that had also been rescued from the USA. Helga is a 1959 MGA 1600 Mk1 that had been decaying in a breaker's yard in Texas for a number of years. 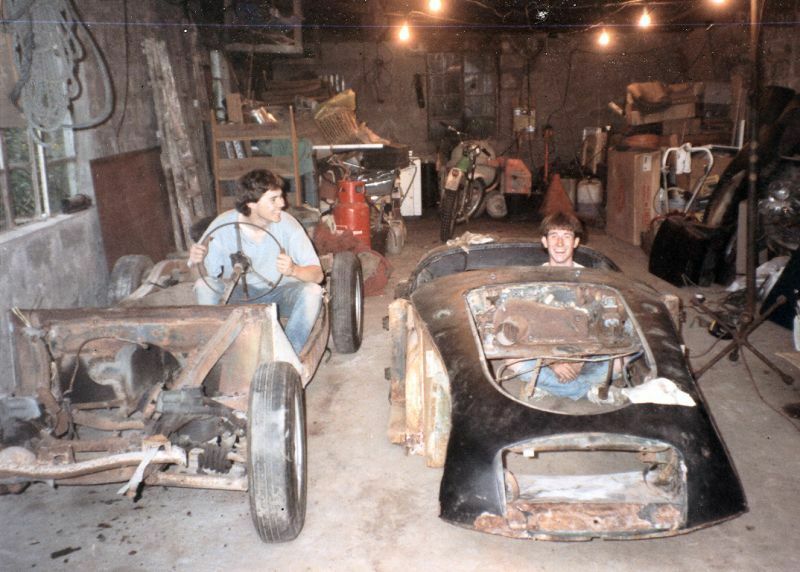 The body and chassis were in reasonably good condition, but the cosmetics were not so good. There were a lot of parts missing including the engine and gearbox, windscreen frame, and most of the the parts that weren't missing needed replacing. Rebuilding the car to original condition would have cost far too much money, so I decided to take advantage of cheaper MGB parts where possible. She was riddled with .22 caliber bullet holes and we found a cartridge casing in the bottom of one of the doors that dated to pre 1973. Helga still has a bullet hole in the one of the inner wheel arch panels. 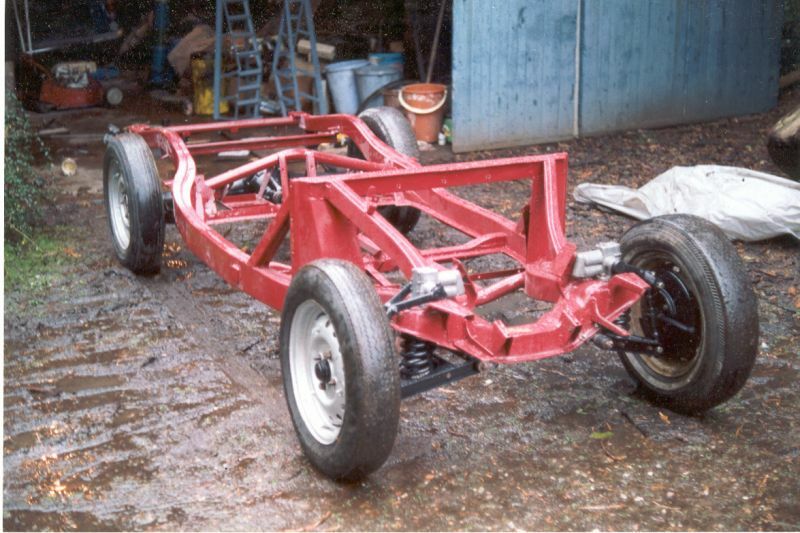 The first step was to remove the body from the chassis. In the picture to the left you can see me (left) and Andrew (right). Andrew gave me a lot of help throughout the restoration. There was a lot of evidence of scary foreign bugs that had once lived in the car (including a dead scorpion) but thankfully I didn't find any that were still alive. 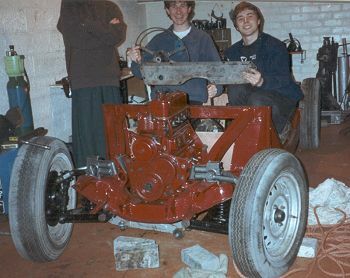 The chassis was in excellent condition and just needed repairs to the floorboard rails, the battery tray and the scuttle. 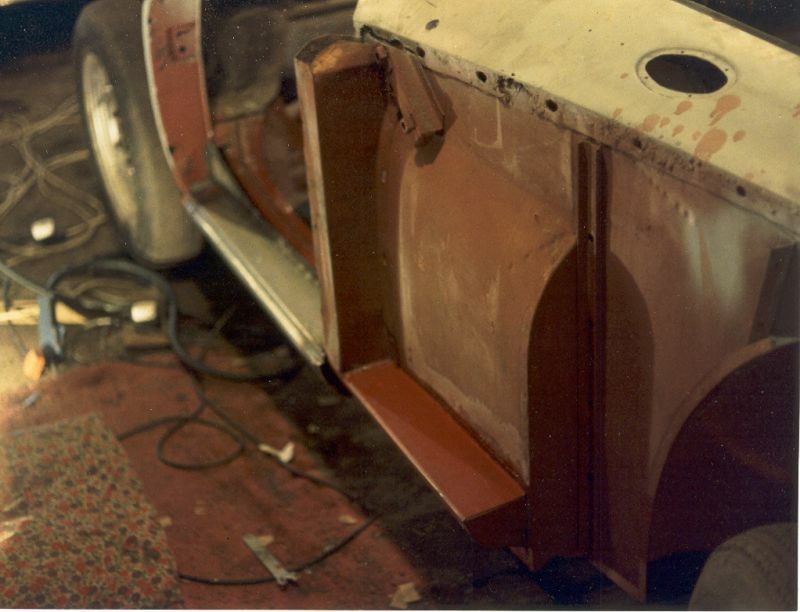 There was hardly any surface corrosion, so it looked immaculate after a coat of red oxide primer. For some reason I painted the chassis burgundy (to match the engine). The suspension only needed new bushes, a new lower wishbone mounting, and reconditioned dampers. I retained the original front and rear springs, although the front springs were to spontaneously explode into several pieces a few years later. The car needed new sills, but the A and B pillar were in good condition so there was no need for the normal "F section" repair. 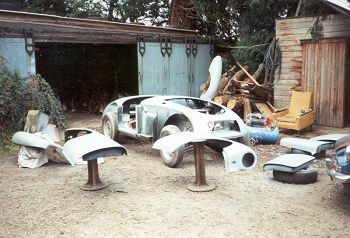 Both the body and the wings had rusted on the seam where the wings bolt on, and both were repaired by carefully cutting out small sections and welding in new sections. 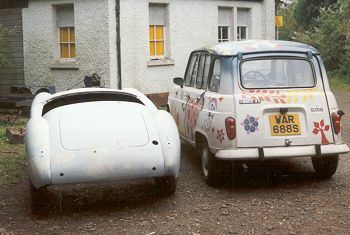 There was a lot of minor body damage, and a new radiator duct panel was needed to straighten out the front of the car. Annoyingly one night after making the repairs I drove a Morris Minor back into the garage and my foot slipped off the clutch. 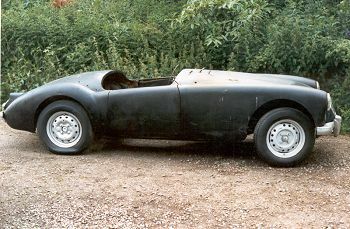 The MGA was sandwiched between the Morris and a generator at the back of the garage, and I bent the brand new duct panel! It gives a big confidence boost to trial fit everything together before painting. I remember thinking it would be excellent (and save a lot of money) to forget about fitting bumpers and exterior trim, and just enjoy the car's lines. 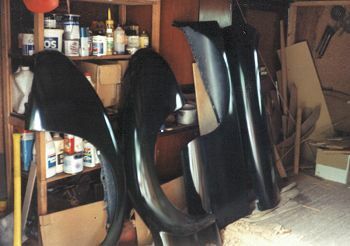 My father took a week off work to help with shaping the panels. He was especially proud of the rear wings. Finally painting could start. It's a slightly unusual paint booth, with panels propped up on old tyres and those metal things used for holding hay bales off the ground. I used cellulose paint, starting with a few coats of high build primer, flatting them down, then a couple of colour coats, more sanding etc. The final colour coat was flatted with 1200 grade sandpaper, then T-cut and polished for a mirror finish. I sprayed the underside of the body and wings with (anti) stone chip primer then painted them in body colour. The body and all of the body panels were stored for a year in a disused industrial freezer to keep them safe while I worked on building the chassis. 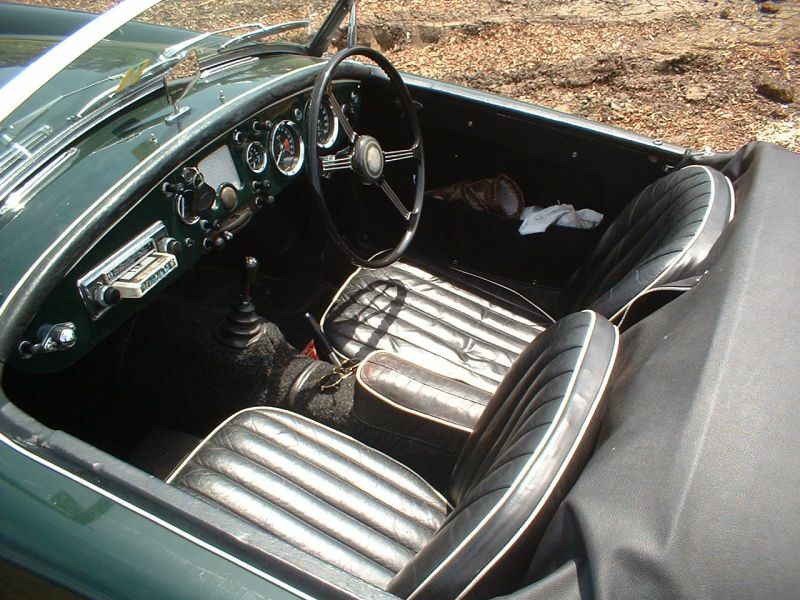 The colour is Jaguar Racing Green. 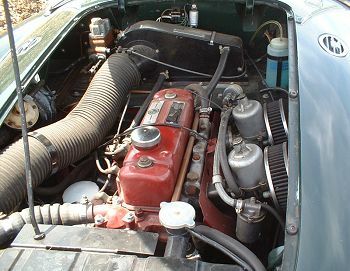 The engine was from an MGB and, like most B-series engines was quite worn. I didn't do much to it apart from paint it. I was running on a limited budget, so it seemed sensible to put money into the body, chassis and interior. 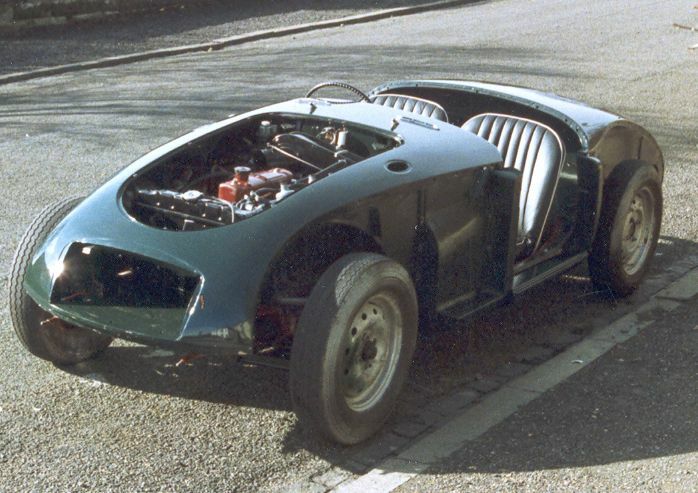 The engine would be easy to change later once finances had recovered. Four years later the engine ran to the point of seizing when the fan belt snapped after a 300 mile drive in the middle of the night. At that point getting home was more important to me than the engine. Two years later something went, and the engine suddenly started burning oil faster than petrol. By that time I had some money for a really nice engine (later). 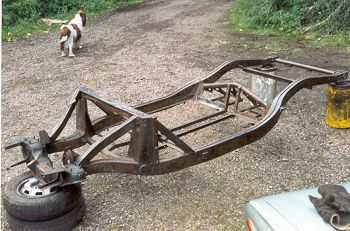 This shot of the chassis shows the new floorboards that Andrew gave me as a 21st birthday present. The transmission tunnel has been modified to make room for an overdrive gearbox from an MGB. This adds a 5th gear to make motorway driving a bit less unpleasant. Only after the first overdrive gearbox blew up did I decide it would be a good idea to modify the floorboards and floor supporting rails to actually get a bit of cooling air around the gearbox. We couldn't resist going for a ride as soon as the mechanical bits were working. The 30 year old sun dried crossply tyres made the test runs very entertaining and the light weight made the car quite lively. It takes an awful lot of time to bolt all the little bits on. Also the little bits seem to be extremely expensive. Many parts were bought second hand. 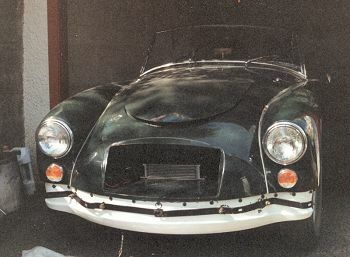 The headlamps were old stock Lucas Powerbeam. That were made in the days before halogen lamps and made a brighter light by drawing more electricity. 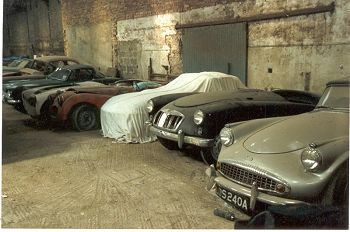 The restoration was completed in the summer of 1995 just before a 2 month period of lovely hot weather. The photographs from here were taken 10 years after the restoration. She still looks great, but then she doesn't go out much in the wet or in winter. Not because it might cause rust, but because I don't like driving with the hood up. I hate the look of the boot rack. 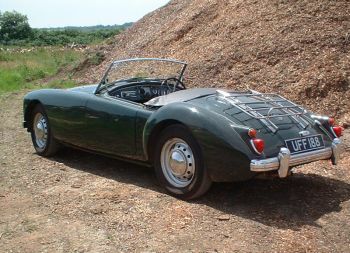 I used it to carry the spare wheel whenever I needed enough space in the boot for a couple of bags. 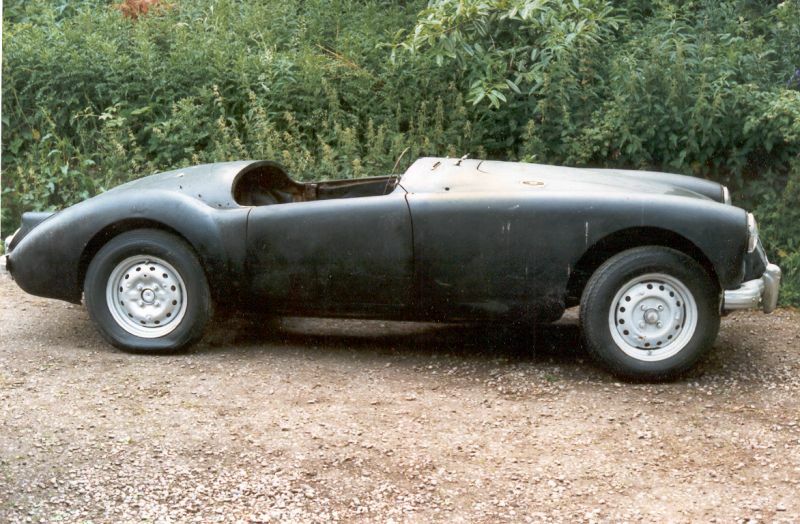 I've since discovered tyre weld which takes up much less space than the spare wheel so I'm planning to remove the boot rack and recover the clean lines of the MGA. 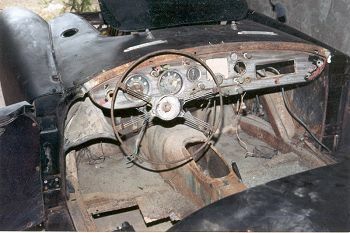 A new dashboard went in during 2001. The old one had been one of those money saving ideas that had involved cutting a section from the left of the dash and moving it across to the right to facilitate the RHD conversion. Also I found an 8 track player (it came with my MGB). It's about 15 years too young for the car, but I feel that's close enough given the car is nearly 50 years old now. 2001 was also the year that the old engine failed. The old MGB engine had plenty of torque, but over 4,000rpm it had taken to smoking a lot. That was no real loss as power has started to die out by then as well. Oselli built me a new 1950cc stage 2 engine. It's marvelous especially above 4,000rpm where the power really kicks in. 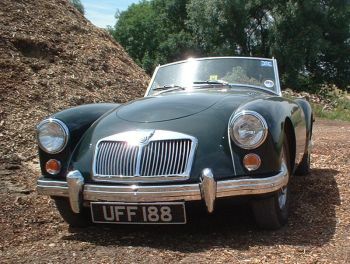 The idle is a bit tractor like, but under power it makes a wonderful noise, popping on over-run like a rally car. 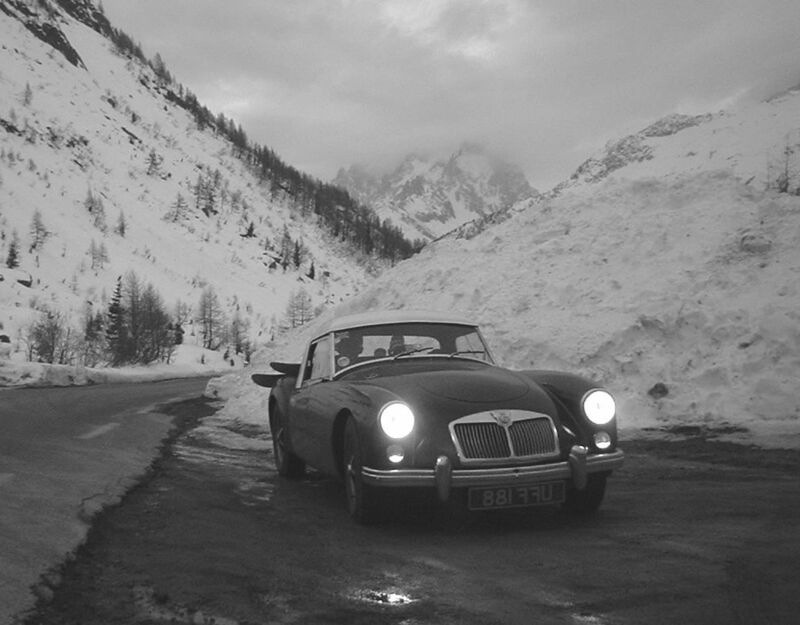 In February 2003, more than 10 years after buying Helga, I set of on a tour of the Alpes. Helga was fitted with a new hardtop, snow tyres, and brake servo. I also spent some time modifying the seats to make them slightly more comfortable. Helga enjoyed a number of mountain passes during the trip and returned with no mechanical problems other intermittent overdrive failure (possibly due to overheating).